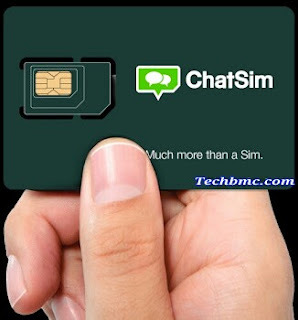 ChatSim has to do with global SIM card that can be used for chatting on many social media messaging apps like WhatsApp chat, Facebook Messenger , LINE, Imo, Telegrammed, Talk, WeChat, QQ, Hike and Kakao and to have it, the chatsim works on all unlocked mobile phones. With just the amount of N4800 you can be able to send unlimited text messages and that of emoji with the above mentioned social media apps example Whatsapp, Messenger and many other apps. The Validity period is one year. The essence of this, is to make the perfect travel companion for all your trips abroad. For genuine globetrotters. The SIM is sold globally at the prize of $12 and in Nigeria it costs N4800, So once you buy the SIM, next thing to do is to visit ChatSim website and then activate it. The first thing to do, is to purchase the SIM, after that, then enter the 19 or 20-digit identifier number on the SIM card and also the number which is assigned to your ChatSim. Then Click on Continue. That's it, next is to manually configure or set your phone's data APN to ChatSIM's settings. You are advised to turn off background data and automatic app updates in your phone's settings screen, reason is because, chat SIM data cannot be used to update your applications or browse the web with any web browser app. Failure to do such may attract your SIM card to be "blocked," which after blocking, you will be required to log into ChatSim's site while using a Wi-Fi connection in order unlock it. So take note. as a user, you can make outbound voice calls through Facebook Messenger app if only you want to. The ChatSim is presently available for purchase at Amazon, Click here to buy it. As it stands now, there are over 150 countries that one can be able to use this chatsim card on and Nigeria is included. Latest Update On BBM Social Media For Android Receives New Features And Bug Fixes. Skype Now Send Messages Using Siri - See What Siri Is All About And How To Enjoy IT. Download The Latest Google Allo 2.0 Version Which Supports Direct Replies, Split-Screen And Many More FeaturesFeatures. "If you want to send or receive multimedia messages or make voice-over-IP (VoIP) calls, you have to buy additional credits. For most countries, ChatSim charges €10 (about $11) for 40MB of data, or €25 (about $27.50) for 100MB. That then gets used by your photo messages and VoIP calls. ChatSim estimates that a 40MB recharge gives you 200 photos, 40 videos, or 80 minutes of calling."